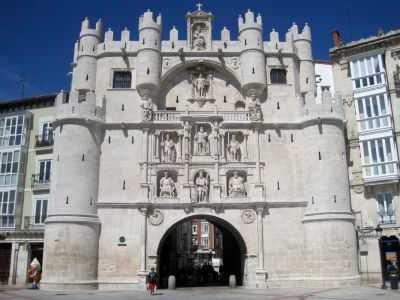 On this half-day private tour you will visit Burgos, a city in Castilla-Leon situated in the Pilgrim´s Road to Santiago de Compostela, still preserves important vestiges of its medieval splendour. The city, which was the capital of the unified kingdom of Castilla-Leon for five centuries, boasts a masterpiece of Spanish Gothic architecture. Aside from a visit to the historic quarter, you can take a quite interesting walk along the banks of the Duero and Arlanza rivers since they are both great places to approach a delicious, varied cuisine. Burgos cathedral is Spain's third largest cathedral and is Burgos' main attraction. Its fortified gate, the Arco de Santa Maria, and Burgos' two monasteries are the main sights. It's a Gothic cathedral notable for its vast size, magnificent Gothic architecture, and unique history. Burgos Cathedral was added to the World Heritage List in 1984 and Frommer's Spain calls it one of Spain's best cathedrals. In 1919 the cathedral is where Rodrigo Díaz de Vivar ("El Cid") and his wife Doña Jimena are both buried. On October 31, 1984, Burgos Cathedral was designated a World Heritage Site by UNESCO. Many of the altars, chapels and monuments within the cathedral are of artistic and historical interest. The magnificent octagonal Chapel of the Condestable is of flamboyant Gothic style, filled with traceries, knights and angels and heraldry. Upon arrival to Burgos, our Private English-Speaking Official Guide will meet you in the lobby of your hotel or at a designated meeting point if you are not staying in a city centre hotel. In front of the restaurant El Cid.